After building my prototype trunion and trial fitting it to the gun I was able to tweak some of the dimensions and put things down on paper so to speak. 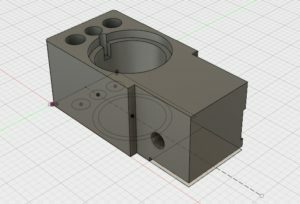 As many of you may have noticed from earlier posts, I have been using FreeCAD. It is light weight and runs well on my laptop which allows me to work on my designs on the road. When drawing up the bolt carrier I ran into a snag. The cam pin slot. My first attempt was to create multiple cylinders that would approximate the path of an end mill. I attempted to combine all of these overlapping cylinders into one object then remove it from the bolt carrier. FreeCAD choked, locked up my computer and I lost all my progress. When researching how this type of operation is usually done in CAD I discovered that FreeCAD does not yet allow you to draw a spline on a curved surface and then have a cylinder follow that spline. Whatever that means. I was chatting with Chuck at GunLab.net and he said he has moved over to Fusion 360 and really likes it. I signed up and discovered that educators like myself (or quite frankly anyone who claims to be a student, educator, or hobbyist) get it for free. That sounds like a bargain to me. Try it yourself and let me know how you like it. Click Here. I started playing around with it and after watching a few videos on youtube I was getting the hang of it and redrawing my trunion design. It was then that I happened across a series of tutorials that really connected with me. One in particular (Click Here) talked about parametric design. It was like a light bulb went off and I realized how this would be the perfect way to do my project as well as any projects down the road. I suggest if you are a complete newb like myself that you watch all his “Learn Fusion 360 or Die Trying” videos. Parametric design deals with designing and dimensioning based on parameters or variables. Parameters are set up ahead of time and given a dimension. Drawing uses the name of the parameter and not the dimension itself. That doesn’t seam like a big difference but if you have to change a dimension because the part doesn’t fit or you want to modify it after the fact, it makes a world of difference. FreeCAD requires you to hunt down the actual step you performed in the design tree and if you did not rename them to something descriptive you will have a tough time. 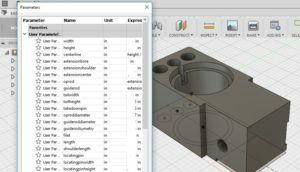 In fusion 360 you only have to change the dimension in the parametric table and it updates the entire drawing to reflect that. This is exactly what I need for this project because after building these two parts I will test fit them and make further refinements to the drawing. It will take seconds to update the drawing. I built the trunion from the ground up in Fusion 360 and after a couple hiccups I have it ready to build. 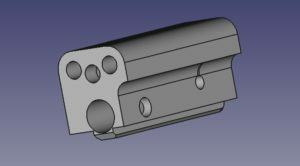 The bolt carrier that I drew in FreeCAD is good enough for now. I only extruded a hole for the cam pin and this will fix the bolt in the fully extended position. 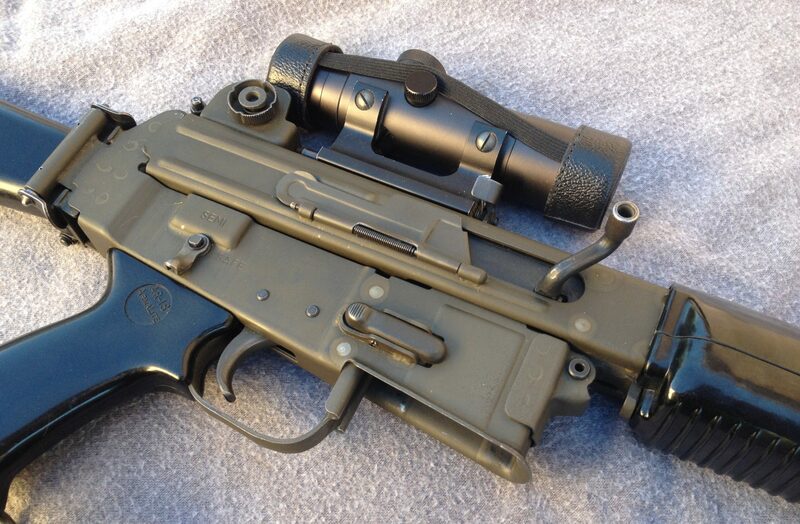 This will allow me to check if rounds will feed and eject. That is the next hurdle and what will require dimension changes in the current design. In addition to using CAD instead of paper drawings I also am going to 3D print these two parts for the initial trials. Only after I have the design working in plastic will I move ahead with making them in steel. I feel like I have actually moved into the end of the last century with my skills.